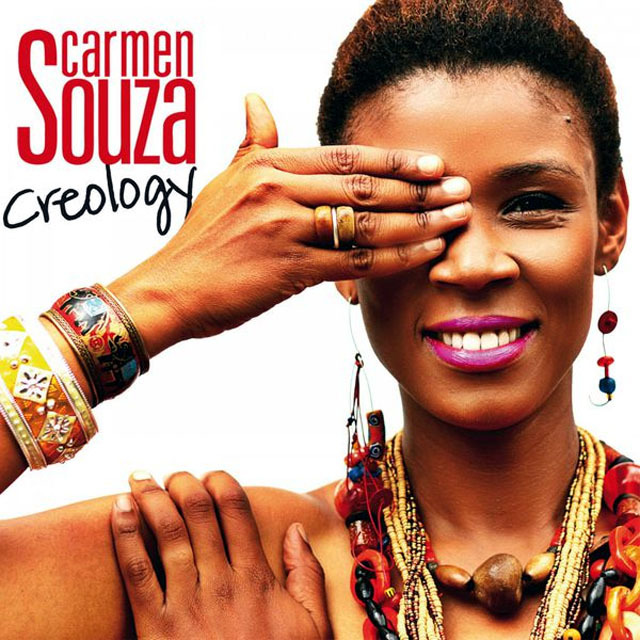 The music of Carmen Souza is both deeply traditional and spectacularly modern and nowhere is this union better distinguished than on Creology. The album brings together twelve songs, ten of which feature lyrics by Souza together with the musician, bassist (and everything else) Theo Pascal. Like every one of the albums that Souza and Pascal have recorded together Creology celebrates the next phase of what everyone holds a collective breath for, not the least Souza and Pascal themselves, a return to the free-wheeling music made from mutual inspiration and joy. The performances of Carmen Souza, Theo Pascal, drummer Elias Kacomanolis and Pascal’s young and prodigiously talented son (drummer) Zoe prove that even in the crowded field of contemporary music there are new things to say. Even more to the point is the fact that this group says them with complete naturalness, for there is nothing contrived or attention-seeking about Souza and Pascal’s approach to this triangular union of the musical traditions of Africa and Cape Verde and Cuba. Their traversal of the music that results from this collision is spellbinding, and for all the right reasons. Where many would be tempted to dive headlong into the rhythmic worlds of the three cultures, Carmen Souza and Theo Pascal are more measured, though both deliver plenty of virtuosity, rhythmically as well as melodically, and especially harmonically as the music unfolds. Despite initial appearances, both musicians are not crazy about re-inventing the creole idiom of Cape Verdean blues and the elementally beautiful melody of “Creology” flows without hint of indulgence. Souza and Theo Pascal also stress the union between Cuban Rumba and Cape Verdean Morna, and bring these out in the often recessed harmonies of the piece. But Carmen Souza and Theo Pascal also turn their attention to the broader elements of African, Cape Verdean and Portuguese music in ways that they have not done before. And the listener experiences the forays into those worlds with the same visceral excitement as the musicians do. Here Souza and Pascal, always with Kacomanolis – and now with the younger Pascal as well – strike a compelling balance between romantic volatility and classical (European) elegance, especially in the newly pronounced piano-playing of Carmen Souza. Each phrase and each lyrical line feels carefully considered and yet part of a bigger cumulative picture, and the warm details Souza’s singular voice – especially in her extended sighs of delight at the end of lines chosen by her – and of the musicians’ touch is captured in superb sound. This is spellbinding Carmen Souza and Theo Pascal music as you’ve never heard before and may be hard-pressed to experience again in such glory – unless they up the ante once again with another album of music like this in the near future. Track List – 1: Ligria; 2: Senhorinha; 3: Upa Neguinho; 4: Pretty Eyes; 5: Mon di Deus; 6: Xinxiroti; 7: Tud Tem 1 Razão; 8: London Light; 9: Kem Ka Tem Cabeca; 10: Homem Musica; 11: Escuta Moçambique; 12: Creology. Personnel – Carmen Souza: lead vocals, acoustic piano and guitar; Theo Pascal: double bass, electric bass, percussion and background vocals; Elias Kacomanolis: drums, percussion and background vocals; Featured Guest – Zoe Pascal: drums and percussion.